As a family we love to dine out, however having young children we normally stick to more relaxed family friendly pubs, as we find them great value, serve food the children love and they have a nice atmosphere. Sometime's you just can't beat a good pub lunch, one of our favourite pub chains to visit is without a doubt the Sizzling pub and Grill chain as the food is delicious and amazing value. We reviewed The Anson Sizzling Pub & Grill last year and visit our local one often. 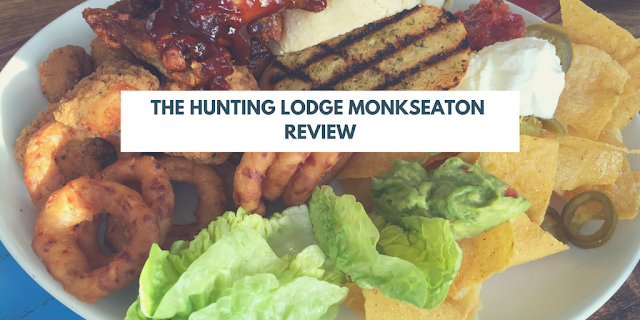 We were recently invited along to try out the menu at the recently refurbished The Hunting Lodge in Monkseaton, Whitley Bay. We have actually visited The Hunting Lodge before, as the other halfs family live nearby, although we have not visited for a few years and we were keen to see if it was as good as we remembered it to be. We visited the Hunting Lodge Sizzling Pub & Grill last Thursday, which was half-term. We had booked a table for 2pm and the pub was half-full after the lunch-time rush. The pub has had a make-over and looked so much nicer and modern compared to when we had previously visited. They have a bar area and then a separate dining area with a few toys and machines to keep children entertained. The staff were really friendly and welcoming and everything was nice and clean and tidy. Like most pubs, you order food at the bar and it is delivered to your table when ready. 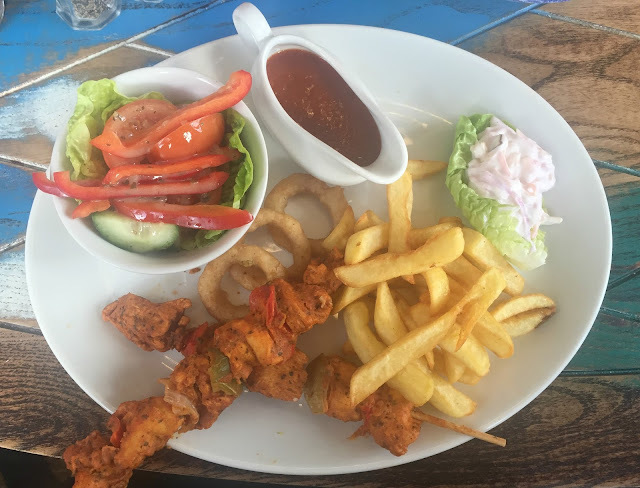 With so much choice on the menu from pub classics like scampi and chips, gammon or chicken tikka as well as ultimate large plates, grills, burgers and light bites there was a meal to suit everyone. As there was six of us dining - myself and the other half, our three children and my teen's friend, we decided to get the House Sharer as a starter for us all to share. The House Sharer (£8.99) consisted of Nachos, Southern-fried chicken pieces, BBQ chicken wings, onion rings, garlic bread and BBQ, Blue cheese and sweet chilli dips. It was tasty. For mains, I decided to get the Lemon Peri-Peri chicken and pepper skewers (£7.79) which came with chips, onion rings, dressed side salad, coleslaw and jug of Peri-Peri sauce. 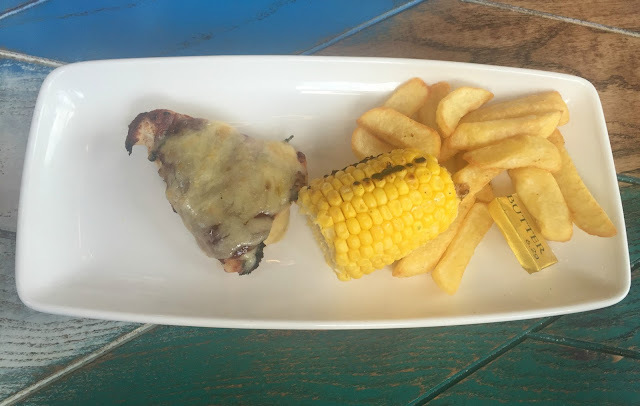 It was a generous portion and tasted delicious, the sauce and chicken tasted very much like a known Peri-Peri chain at a fraction of the price. 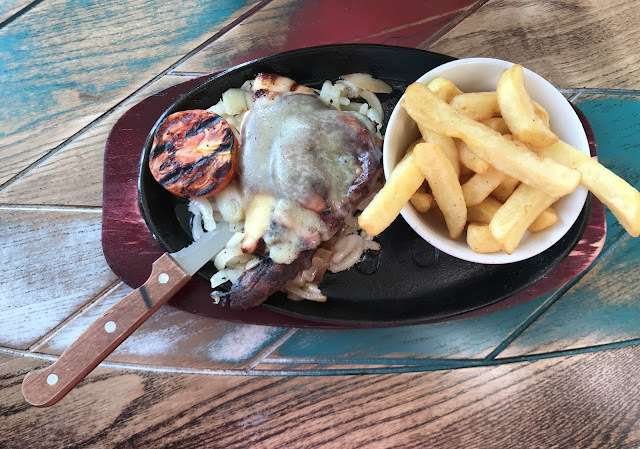 My teen ordered BBQ Hunters Chicken (£5.99) which came sizzling on a bed of onions, served with chips and a grilled tomato. The chicken was a bit overcooked and the onions a tad undercooked, but she enjoyed it and demolished the lot. 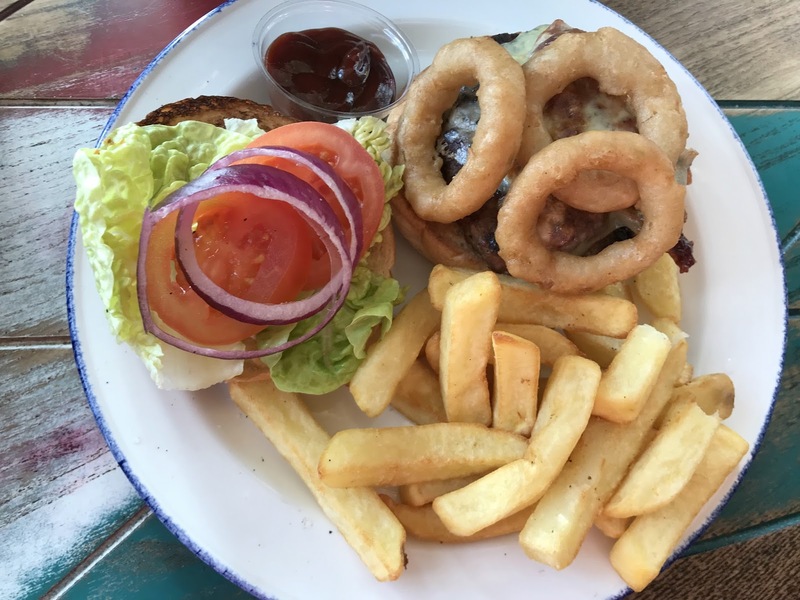 Her friend ordered the Backyard BBQ Burger (£7.79) which was a burger topped with BBQ pulled pork, salad, cheese and onion rings, served with chips and a BBQ dip. Again it was a generous portion and was demolished. The other half has eyes bigger than his belly and ordered from the Ultimate plate section, after much pondering he went for the Chick-Tastic (£10.29). 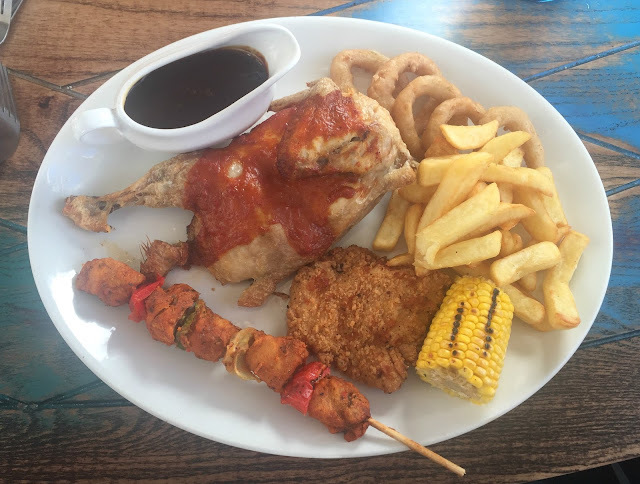 This was a huge plate of half a roast BBQ chicken, a lemon Per-Peri chicken skewer, a southern fried chicken fillet served with chips, onion rings, corn on the cob, grilled tomatoes and a jug of BBQ gravy. He has already asked to return so he can have more BBQ gravy as he enjoyed it that much! 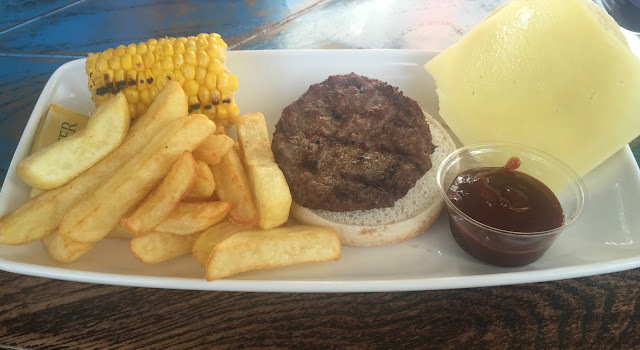 Kids menus are available which include a main, dessert and drink for £4.99, all day every day and they also had kids eat for £1 with every adult meal purchased offer on when we visited. They have a smaller under 5s menu or an over 5s menu, both my little two are under 5 but they liked the sound of the meals on the over 5s menu best. Sophia ordered a cheeseburger with a side of chips and corn on the cob. You can pick the sides from a selection to create a meal your child will enjoy. Sophia loved her burger and ate the lot. Jacob decided to copy his big sister and tried the BBQ chicken, with chips and a corn on the cob. We were so full of mains that most of us skipped dessert. The little two had to build your own sundaes which came with their meal deal. My teen also ordered a black forest sundae (£4.29) which was huge. We all really enjoyed our meals and had a lovely relaxing meal, we could not fault the food or the service at all. The total bill came to around £65 which we thought was really good value for a sharing starter, four adult mains, one dessert, two children meals with desserts and two rounds of drinks for six people. If you are looking for somewhere to dine with children in North Tyneside then I really do recommend a visit to The Hunting Lodge Sizzling Pub & Grill in Monkseaton, Whitley Bay. We certainly won't be waiting so long to revisit again. You can view the Hunting Lodge menu and check opening times on the website. Disclosure: We received a £50 voucher towards this meal, however all views are my own. I LOVE the sizzling pub and grill brand so it doesn't surprise me to see such amazing food in your photos!! The food looks amazing me and the hubby would so go for the house platter. The black Forrest sunde looks delicious too. Ooh that looks like proper pub grub, and big portions too! Looks delicious! This is exactly the kind of food I love and that dessert, wow! Oh this food looks so good. I'm jealous of that sundae especially. I love a traditional eatery and the food does look amazing. 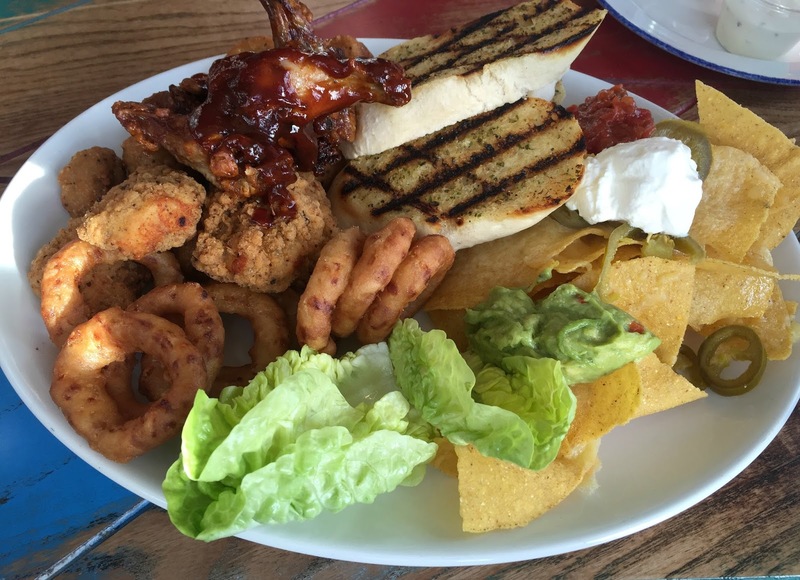 I could use that sharing platter just about now! We love pub dinners and have them quite a lot as little lunch dates . Looks delicious!! oh that looks delicious and i love a good pub meal! The food looks very good. 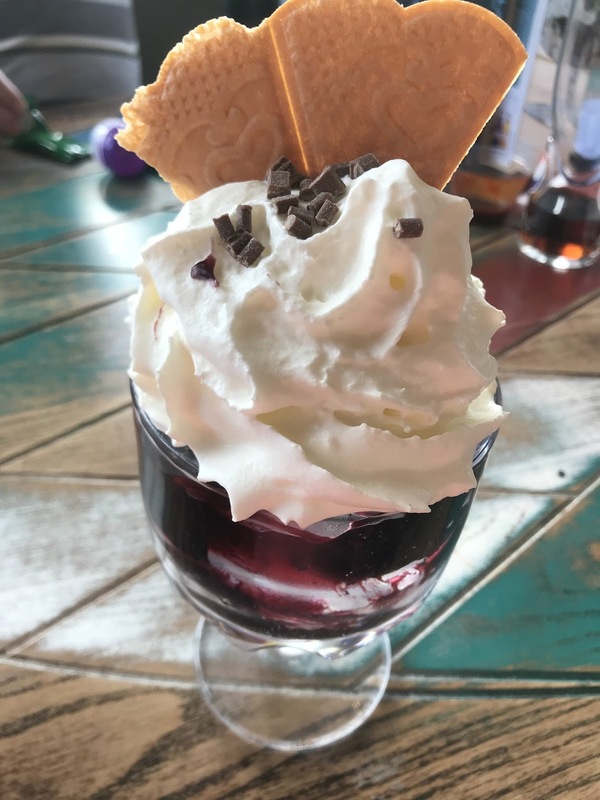 The Black Forest Sundae looks yummy. This looks like really good pub food I love the look of the Peri chicken! I'm really hungry now after reading this! 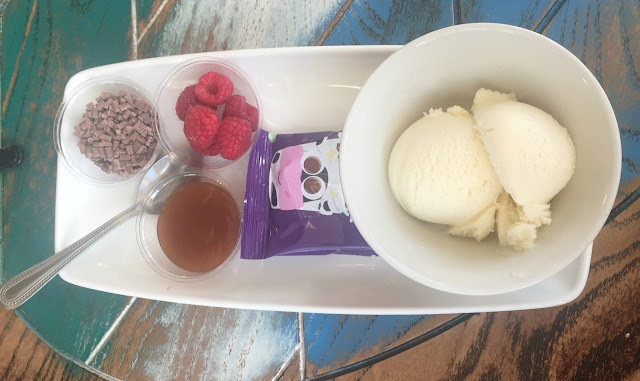 My kids would love the build your own icecream.